Kelly & Austin: The Internets! 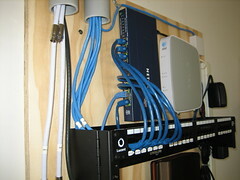 I finally finished up the first phase of my home wiring project last weekend. The goal was to create a central point for all data wiring as well as get some of the heat producing equipment out of the office before summer gets here. The server is primarily for hosting video files for my Tivo using the pyTivo software package. It shows up in the Tivo "Now Playing" list just like another folder and I can browse through all of my stored movies and TV shows. 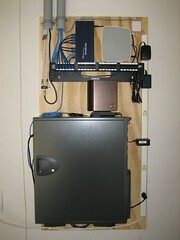 The network is all Cat5e. I was going to use Cat6 but decided that the extra cost and physical constraints (bend radius, outside cable diameter) were more trouble than it was worth. The video cable is all quad shielded RG6 with compression fittings. I went with white so that I could easily tell the new coax runs apart from the old stuff up in the ceiling. It's not UV safe, but there is only one feed line from the box outside into the garage that is exposed to the elements and I have black cable out there. I ordered the cable spools and most of the hardware from Monoprice. They have great prices and cheap shipping on all kinds of network and A/V wiring. Check there first if you ever need to buy HDMI cables. The backing board, PVC, and assorted screws are all from the local Home Depot. 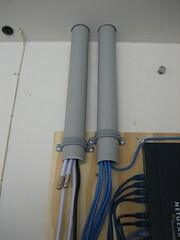 Cabling engineer is credit to team! I've been looking for a proper TiVo server program forever. I just downloaded and tested the Mac OS version of pyTiVo and it works perfectly! WOO-HOO!!! I started reading this...and then stopped and thought WHAT!?!? then I was done reading it. I'm sure it's really cool though. Since you are so innovative.